Hers’ a solution for Oppo A71 if having an audio problem with the speaker or Ringer. This solution will make your troubleshooting easy and quick also you will find Oppo A71 Speaker Ways and ringer ic jumper. 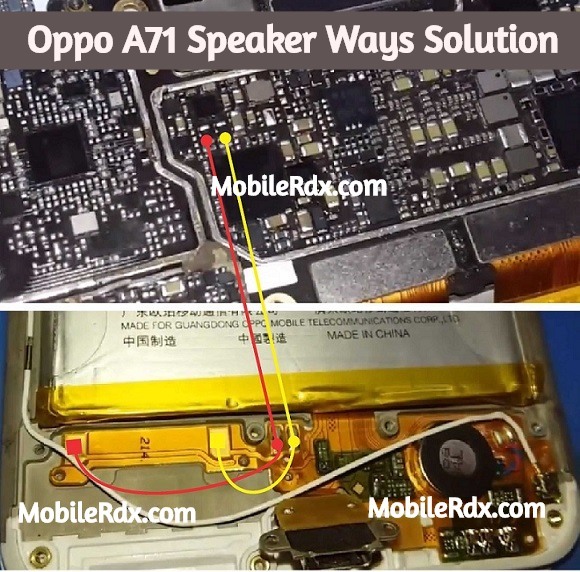 To repair the Oppo A71 hands, free speaker, you may first clean the speaker terminal contact pads on the PCB board if there is corrosion and oxidation build up., then check the speaker using a multimeter to easily determine if it’s working or not. Replace a damaged speaker if found. If the speaker confirmed okay, you may refer to the solution below and do have a check and test procedure on some components which is associated or connected with the hands-free speaker circuit. No Sound in Redmi Oppo A71 Speaker. Oppo A71 Speaker ways might be faulty. Low sound and distorted sound normally occurs when there is dust on buzzer mesh or when the Speaker is faulty. No continuity between ringer contacts and coils. Problem with the onboard connector of the ringer, however, this happens in a very rare case, and there is a thousand in chances that speaker problem was due to problem with the on-board connector. Restart your Oppo A71 phone and check.